Ever hear the term “rooney gun”? Ya know, competition-only firearms and gear that could never be useful real world? Here’s why that concept is BS. After seeing benefits of RDS use on duty pistols, a number of officers around here had sub-compact back-up (BUG) and compact off-duty pistols equipped with RDS’s (primarily S&W Shield, G26, S&W M&P9c, and G19). Interestingly, many felt the compact pistols with shorter slides were actually easier to shoot accurately and rapidly with the RDS compared to the larger duty pistols. With an RDS equipped pistol, there is no “sight radius”, so there is no accuracy benefit to having a pistol with a longer slide. In addition, many end-users report that when shooting rapidly, it is easier to track the RDS dot shot-to-shot when mounted on a shorter slide. As a result, many shooters who previously used long slide, iron sighted pistols like the G34/G35 to benefit from the enhanced sight radius on demanding shots requiring precision accuracy have now found they can use a smaller pistol like a G19 with an RDS and shoot just as accurately with the smaller pistol as they previously would with longer iron sighted handguns. Going one step further, folks found that with a compensator installed, they can have a compact handgun that is softer shooting, lighter weight, and offers better accuracy than their previous iron sighted long slide pistols. 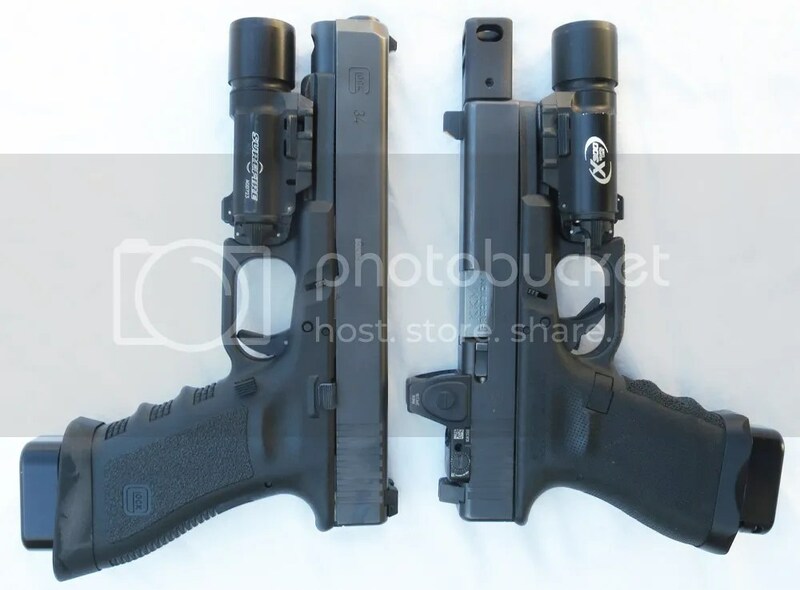 As a result, late last year, we began testing the use of RDS equipped G19’s with KKM compensators attached. Note that this is described in our 5 yr updated RDS test report. The KKM compensated G19’s have a bit more blast than a stock G19, but not anything to complain about. In slow fire at 25 yds, they shoot just as accurately as any other G19 with a match barrel–I shot two KKM compensated G19’s yesterday slow fire at 25 yds and got a 100-5x & 99-3x. Where the KKM compensated G19’s shine is in rapid fire, they are slightly faster, but more importantly result in much tighter shot groups, especially at longer distances. I am a huge fan of the DOW; a couple of recent DOW allowed quantifiable data to be gleaned from shooting the same drill with a G19 with both a KKM compensated barrel and a non-compensated KKM barrel: https://pistol-forum.com/showthread&#8230;.06-Three-Bills and https://pistol-forum.com/showthread&#8230;.ek-108-GM-Test. The compensated G19 was consistently faster to shoot–particularly at longer ranges, generally offered better accuracy, and had noticeably tighter groups. When shot 10 rounds slow fire at 25 yds on an NRA B8 target, the KKM comp barrel shot 99-3x, the KKM standard barrel shot 100-3x. The G19 with KKM compensator is the same size as the previously used G34’s and fit into standard G34 holsters, including the excellent Safariland ALS 6354DO. The author and builder of this pistol has carried this concealed AIWB, and intended it as a replacement for G343/35-size pistols with light mounts that were being carried previously. NRA Outdoor, Bianchi/NRA Action, and IPSC/USPSA open guns were harshly criticized as being rooney guns, because accessories like a red dot sight and/or compensators had no place on a real carry gun. Electronic sights were especially criticized. When first used in bullseye and then the Bianchi Cup in the late 1970s and early 1980s, they were so new and “Star Wars” to be taken seriously. People surmised they were also slow, until Jerry Barnhart used an optic to win the USPSA Nationals in 1990. When competition shooters beat them up enough and manufacturers eventually learned how to make them robust, military and law enforcement began using these sights on long guns. As technology allowed miniaturization, the sights were small enough to slide mount and became a fixture on IPSC Modified guns. Now this technology can be had on real world handguns. This is nothing new and has been happening for a long time. Just a minor response on the (relatively) short barrels on the compensated pistols in the base story. I have a Glock 31. I also have 68+ year-old eyes. On night shoots with most brands of ammo, I can see the sights and target on the first shot, after that, the muzzle flash blinds me for several seconds. There are several Glock (and other brands’) pistols that have recoil reducing ports cut in the upper front of the barrel and slide. These make 2nd, 3rd, etc. night shots a challenge too. My point here: old farts with old eyes may need to be selective of the ammo they use for low light use. Good points. There is not much emphasis on the effects of muzzle flash and blast from your own firearm. For that matter, how many tactical classes have students shooting a live exercise without ear and eye protection, day and/or night, at least to familiarize with how shooting will feel without protection that won’t be on in a chance altercation but we take for granted on the range. For all the griping about “real world” training I don’t know of any tactical types considering this. A few shots without ear plugs or muffs would be OK, but I can tell you the long term effect is very bad. My right ear hears virtually no high pitches. Neither ear can hear a wrist watch alarm or a bunch of bad noises my car makes … that my wife has to tell me about. Regards from your deaf because dumb shipmate. Oh, I know there are long term health repercussions. And I’m not suggesting or recommending this as a general training procedure. I’m just saying it is a reality many “real world” types don’t seem to ever address. My ears go “EEEEEEEEEEEEEEEEEEEEEEEEEEEEEEEEEEEEEEEEEEEEEEEEEEEEEEEEEEEEEEEEEEEEEEEEEEEEEEEEEEEEEEEEEEEEEEEEEEEEEEEEEEEEEEEEEEEEEEEEEEEEEEEEEEEEEEEEEEEEEEEEEEEEEEEEEEEEEEEEEEE” all the time.